This delightful market began in November 2012 and is the brain child of Nola, a Canadian artist relocated in Chicxulub. Here is how Nola explains her creation: “When I first went to Bamboo Beach to help Sharon with the food bank I fell in love with the beauty and peacefulness of the space and realized that it would be a wonderful venue for anything. 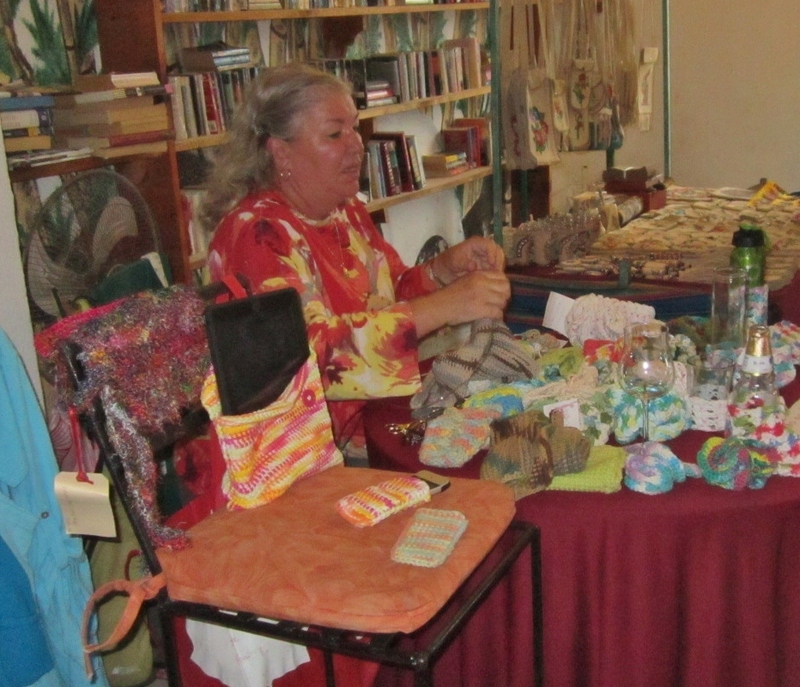 I didn’t speak spanish so I approach Sharon with the idea and asked her to help me talk to Charlie about using the space once a month for a small venue for local artisans so they might have an opportunity to earn some extra money. I never expected it to turn into a Mulitcultural Market for artisans and crafters from Yucatan and other parts of the world. 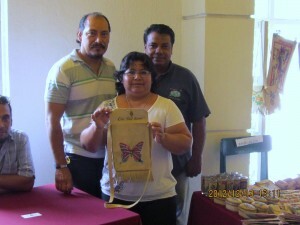 For Socorro, it is the only way she can provide for her family. For Rosa it gives her hope. And for tourists and expats it affords them a chance to buy authentic and handmade local Yucatan crafts to take back to their countries. 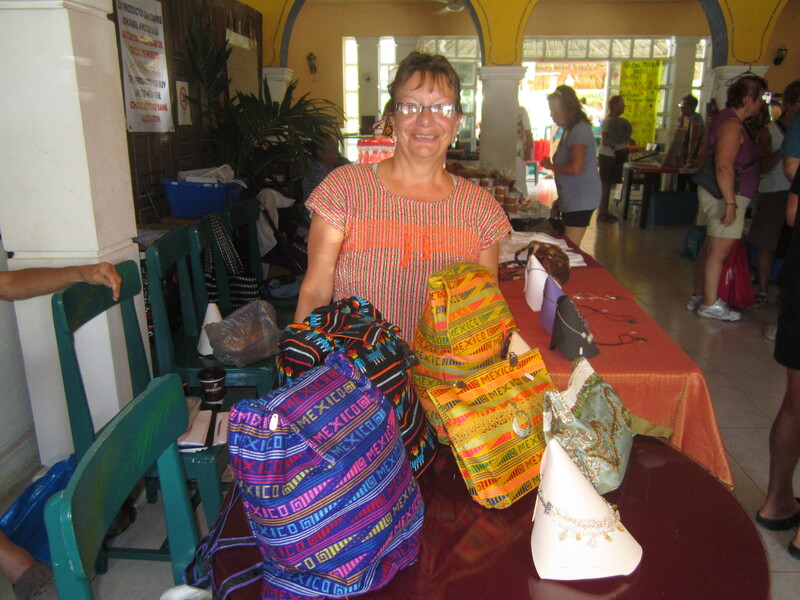 The Chicxulub artisans’ market, inaugurated late last fall at the Bamboo Beach restaurant, has provided help to those in need, in a community where poverty lives on many streets. 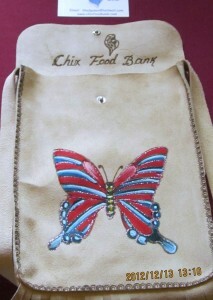 Socorro creates crocheted purses using yarn and silver or coloured pop can tabs. It is the only income she has for the six she supports in her tiny house since her husband, an alcoholic, left her. Rosa makes peanut butter. The money she gets from sales helps a household that has known hard times since they lost their house. 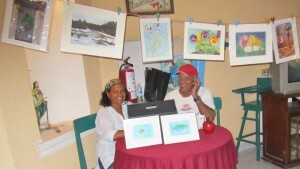 It had to be sold to pay medical bills when Rosa became seriously ill. The market, called Bazar del Muelle, was launched by Canadian Nola Melin, who moved to Chicxulub a year ago. She had met Chicxulub Food Bank founder, Sharon Helgason, whose one of many goals had been for crafts people to have a place to sell their products. Melin developed the idea and started the market as a monthly event. 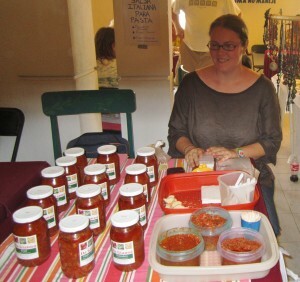 It was soon so successful it became a twice-monthly market that attracted vendors from the Slow Food Market in Merida, as well as craft artists from the surrounding Progreso and Merida areas. 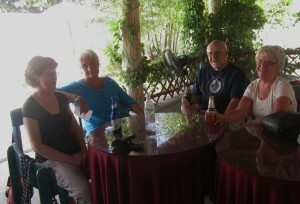 Tourists and expats showed up in droves to buy and to meet friends at the new and popular gathering place. 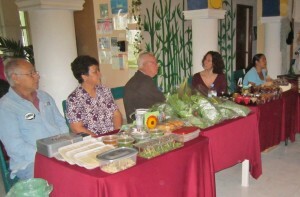 They loved the idea that they could buy fresh, organic eggs, organic salad greens, and organic breads from Monique’s, an artisan baker from Merida, local condiments and jams, tomato sauces, baked goods, food items and fashions from Olga Cuevas of Merida. 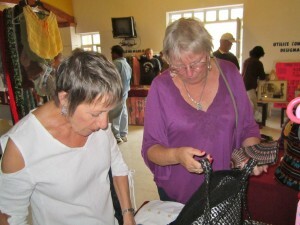 They were delighted to find art and crafts handmade by local artisans. A chef from British Columbia took jars of red pepper jelly home for Christmas gifts. 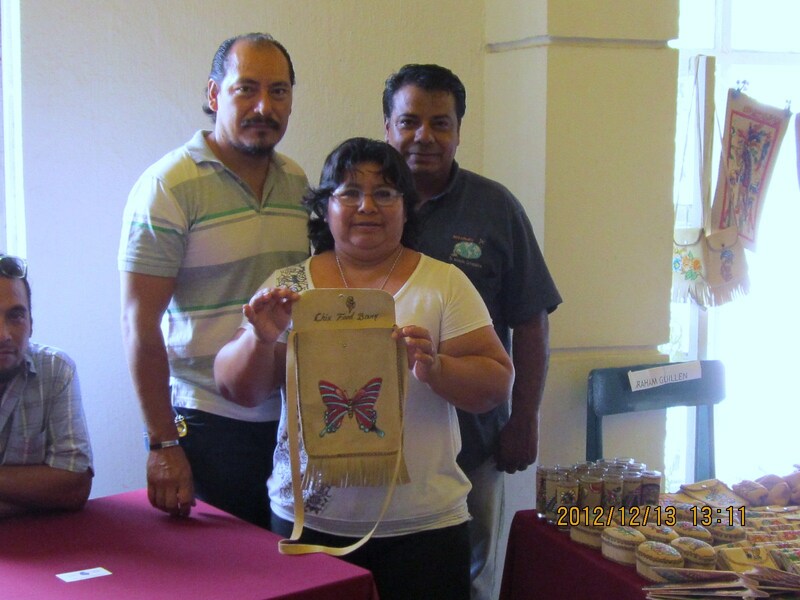 Socorro’s purses were snapped up, Rosa’s peanut butter drew rave reviews, Merida artist Joel Rios had buyers and Abraham from Chiapas sold his personalized soft leather bookmarks and key chains. 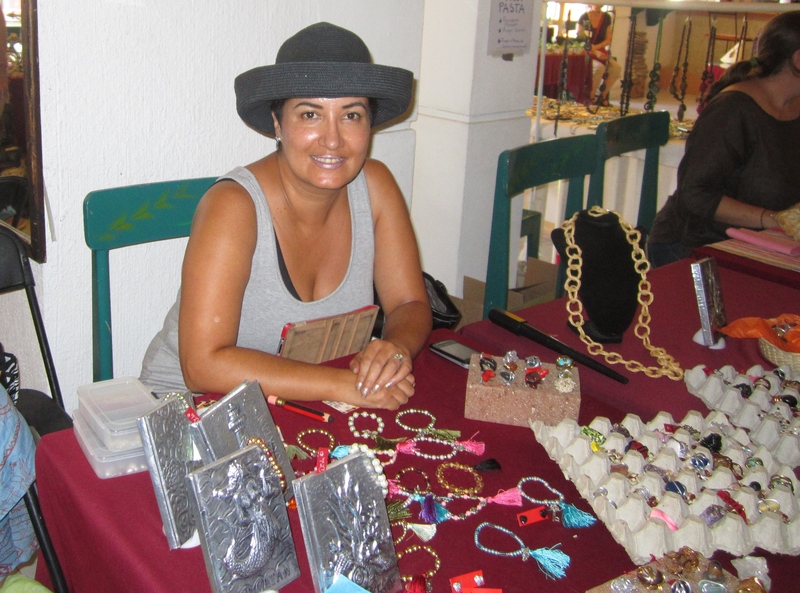 ‘I didn’t expect it would turn into a market for artisans and crafters from the Merida area,” says Melin, who found that the market took on energy of its own. Even Canadian wintering residents and Americans in the area got involved. 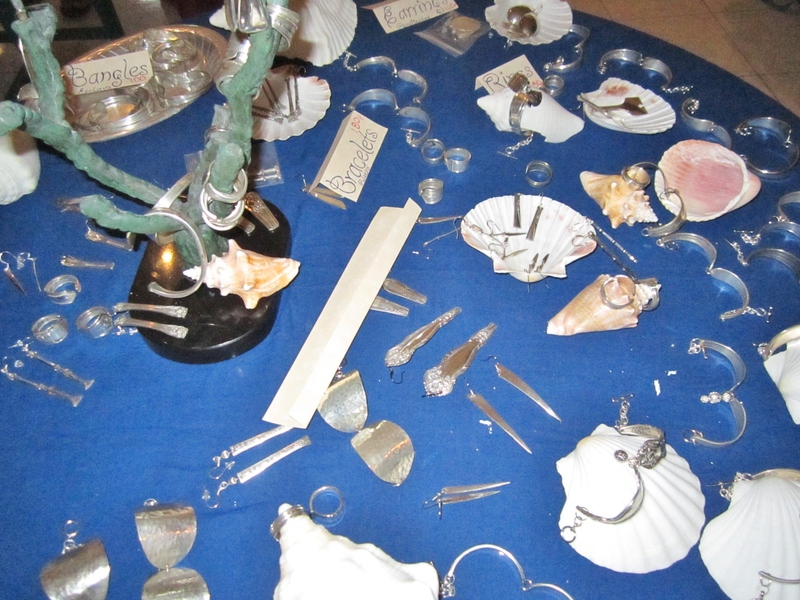 Jean Koopman from Nova Scotia set up a stall with silver jewellry she created from old forks, spoons and knives found at garage sales. She donated her sales money to the food bank and was able to support a family for the food bank’s Adopt-a-Family program. 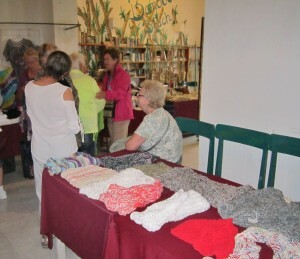 American artist, Linda Tragemann, a new resident in the area, sold her upscale knitwear and yarn items, unique necklaces and rugs to thrilled fashionistas and home decor collectors always on a quest to find something different. “My hope is that it will continue to be a place for creative people to meet and for visitors to find unique and interesting things to buy for their homes, families and friends”, says Melin. 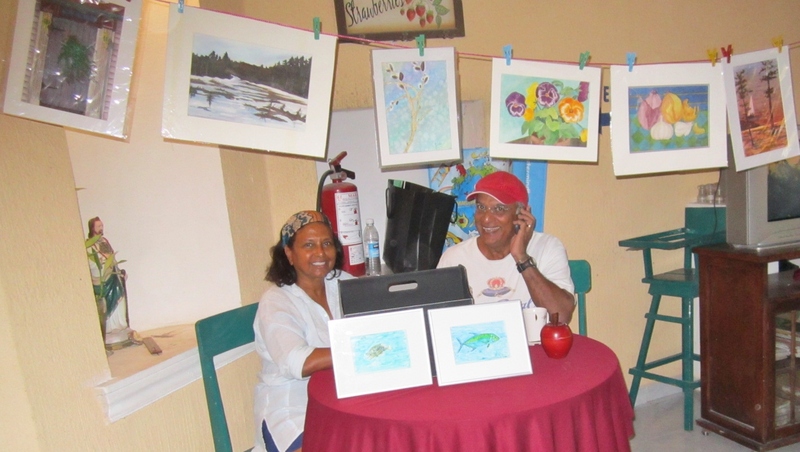 Muelle Market will re-open December 2013. For information contact Nola Melin at muellemarket@gmail.com. What a delightful surprise we found at Bamboo Beach yesterday! 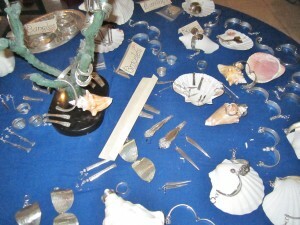 What a wonderful array of vendors offering assorted wares from fine art, to crafts, to food items. It was wonderful … I should have purchased more! How often does the bazaar take place? The Bazar del Muelle is a successful project run by Nola who began it last year. 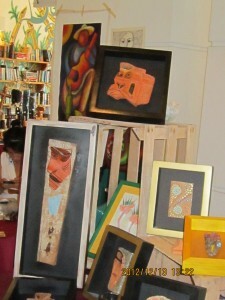 The next bazar is on March 13th and is the final one of the season. 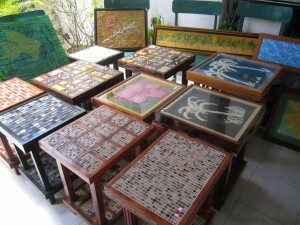 There are many talented artisans in Yucatan and it is a pleasure to showcase them. Thanks for your comment and am glad you enjoyed it.